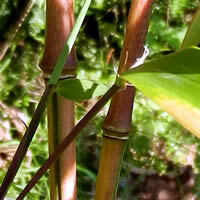 There are all kinds of bamboos that make a fantastic ornamental bamboo garden whether in the ground or in pots. Although most species have green leaves and green canes, there are many species that have coloured canes or variegated leaves (striped green/white/cream). Variations in colour and stripes can occur seasonally or change through the lifespan of the plant. They may have vibrant colours when young that fade as they get older, or they may change from one colour to another. Each species will have its own characteristics in the same way that flowering plants and grasses do... seasonally. Don't be disappointed if the plant does not reach your expectations during one of the seasons. I always think that spring and autumn brings out the best colours in the natural world and a bamboo garden in different seasons is no exception! Variegated leaves vary in vibrancy according to age and exposure to sunlight, most are at their brightest when the leaf is new/young, and some get duller through age or sunlight. Coloured canes can also vary through their age with some starting off as one colour and changing as they get older. 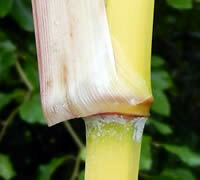 Bamboos with yellow canes are usually yellow throughout their lifespan but can occasionally start off green. Black bamboo species usually start with green canes which then turn black, but in established and older plants the young canes will often be black from the start. 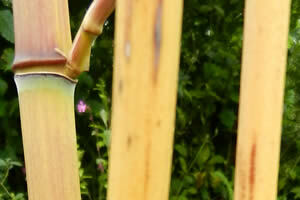 Other coloured bamboos, such as red, blue, or white, also can change throughout their lifespan. Sometimes the colours are spectacular and vibrant, usually in the young fresh canes, and other times they can change colour as they get older. Striped canes - some species have striped canes on young and new growth that then turns to green, others retain the stripes (striations) throughout the lifespan of the plant. Gigantochloa Atroviolacea - Black Bamboo - Clumping - In tropical climates it can reach heights up to 50/60 feet with 4 inch culms. Very large - striking black stems. Needs full sun to achieve the best striking black stem colour. Phyllostachys nigra - Black Bamboo can reach heights of 8 or 9 metres (30 ft.), and even up to 12 m (40 ft.) in the right conditions and climate. Normally a maximum culm diameter of 5 cm. (2 in.). Phyllostachys aureosulcata f. spectabilis - In the right conditions this colourful ornamental species of bamboo can reach 9 metres (30ft. ), an average height expected is around 6 m (20 ft.) with an approximate culm diameter of 4.5 cm (1.75 in.). Hibanobambusa Tranquillans ‘Shiroshima’ - very ornamental running species. Height up to 10 feet. Needs bright light for best colouring. Highly variegated large green/white leaves, individual patterns. Bambusa Multiplex ‘Alphonse Karr’ - Clumping. Height approx 18 feet. Culm diameter up to 1-1/2 inches. Tolerant of full sun. Bright yellow stems with green stripes. New shoots and stems sometimes reddish in colour. Leaves can be variegated white and green. Chusquea gigantea syn: (Chusquea breviglumis) for a giant big bamboo to make an impact in your landscaping project. A clumping species, cold hard to -18°C (0°F) for zone 6, height 10 metres (32 ft.) to 16 metres (52 ft.), with a culm width that could make 6 cm (2.4 inches). Sinobambusa Tootsik Albostriata - Running species. Approx height 12 feet. Culm diameter up to 1-1/2 inches. Very erect canes with green and white variegated leaves. Otatea Acuminata- Weeping Bamboo, Mexican - Clumping. Approx height 12 feet. Diameter of culms up to 1-1/2 inch. Wide spaced canes with light green long narrow leaves. Attractive weeping habit. Tolerant of full sun. Pleioblastus Shibuyanus - ‘Tsuboi’ - Running species. Approx height to 3 feet. Small white striped leaves. Vigorous growth. Prefers low light, not toerant of full sun. Will lose vibrant variegation if too dark. Purple with orange sheaths - Fargesia scabrida Asian Wonder.